The United Nations reports remarkable progress in containing HIV, the virus that causes AIDS. In its latest report, released in advance of World AIDS Day, UNAIDS said access to treatment has risen significantly. The report said 21 million HIV positive people are on treatment. That's more than half of all people living with HIV. The UN's goal is to end the pandemic by 2030. Dr. Anthony Fauci has been working to end the AIDS pandemic since the 1980’s, when an HIV diagnosis was a death sentence. Now people with HIV can expect to have a normal lifespan if they are on treatment. Fauci is a world-renown doctor who heads the National Institute of Allergy and Infectious Diseases at the U.S. National Institutes of Health. He says we have the tools right now to end AIDS. “When I say that we have the scientific, evidence-based ability to end the pandemic as we know it, what I mean is that we have extraordinarily effective drugs, but recently those drugs have been shown over the past few years, not only to save the lives of the people who take the drugs, but also to bring the level of virus in an infected person so low, below detectable levels, that it makes it virtually impossible for that person to transmit the virus to someone else." 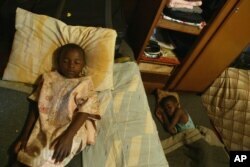 FILE - Children take an afternoon nap at an orphanage in Harare, Zimbabwe, May 26, 2006. One of the biggest problems caused by AIDS in Africa is the number of children who are being orphaned as the disease kills their parents and guardians. Another tool is pre-exposure prophylaxis, or PrEP. It's a prescription medicine that can help reduce the risk of getting HIV when taken daily. But there are some chinks in the armament. People on the drugs face the same challenges as anyone else who takes medications on a daily basis. Not everyone remembers to take it. Prescriptions can run out. It can be difficult to get prescriptions filled. And then, there are 16 million people infected with HIV not on therapy. Many in this group don't know they have the disease, so they continue to spread the virus. Some of them don't have access to healthcare, so they don't get tested. UNAIDS reports that some 1.8 million people were newly-infected with HIV in 2016. That's a 39 percent decrease from the 3 million who became newly-infected at the peak of the epidemic in the late 1990's. In sub-Saharan Africa, once the epicenter of the AIDS pandemic, new HIV infections have fallen by 48 percent since 2000. But in Eastern Europe and Central Asia, the report says new HIV infections have risen by 60 percent since 2010, and AIDS-related deaths have increased by 27 percent. That's why, even with the tools we now have, Fauci doesn't see an end to AIDS without an HIV vaccine. A clinical trial for an AIDS vaccine took place in Thailand several years ago. That vaccine proved to be 31 percent effective, "not enough for prime time," as Fauci puts it. Compare 31 percent efficacy to the measles vaccine, which protects up to 99 percent of those who get vaccinated. Fauci told VOA he is not sure if scientists can develop an AIDS vaccine which is that good. A nurse takes blood for a free HIV test during a HIV prevention campaign marking the World AIDS Day in Lima, Peru Dec. 1, 2016. "I don't think we're going to get there with an HIV vaccine, but even a vaccine that's 50, 55, at the most, 60 percent effective together with the implementation of the other advances we have, I believe we could turn around the trajectory of the epidemic and essentially end it as we know it." Another vaccine trial is taking place in South Africa. The results won't be in until 2019 at the earliest, and there's no way of telling if it will be good enough to help end AIDS. Meanwhile, getting more people tested, getting more people on anti-AIDS drugs, consistent use of condoms and limiting the number of sexual partners are the tools we have on hand to reduce the spread of AIDS. Both Fauci and UNAIDS say ending AIDS is up to the global community, and how much effort and money it is willing to commit toward this goal. 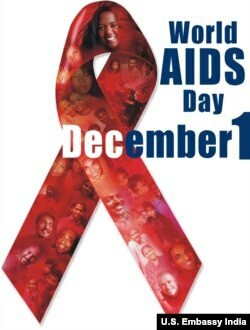 As we observe the 30th World AIDS Day on December 1st, there's still a lot more to do.